Topics : Analytic functions, Cauchy integral theorem, Singularities, Taylor and Laurent series expansion, Contour integration, Analytic continuation. Plan of the workshop : On each day, there will be two one-and-half-hour classes in the forenoon and tutorial sessions in the afternoon. The tutorial sessions will be exclusively for solving the problems and clearing the doubts. As residential facility would be provided to the outstation participants, the tutorial sessions would be extended on the first day to provide sufficient opportunity for the participants to discuss their doubts. Desirable : The participants can try to read the relevant sections in the suggested text and attempt to solve some exercise problems (if not, at least, worked examples) so that their reception and interaction will be more effective during the workshop. 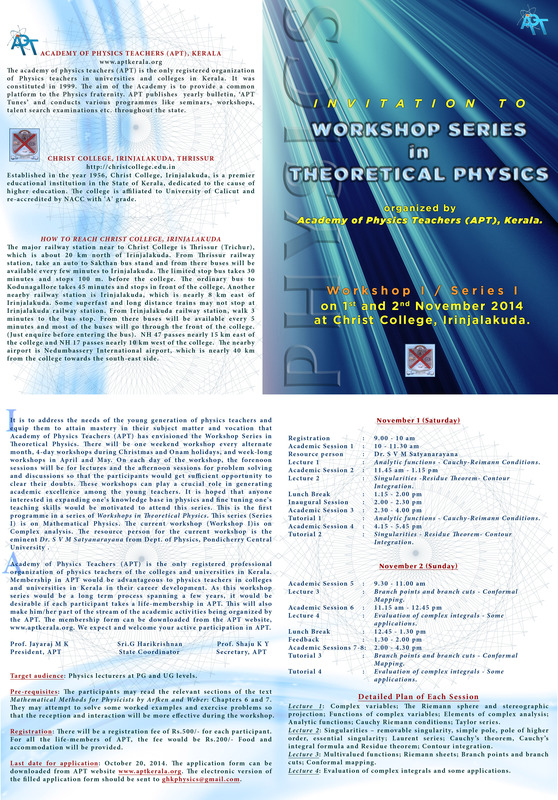 You are viewing PhysicsKerala, APT Workshop Series in Theoretical Physics Click Here for more Recent Updates ... Question Papers and study materials..are available to download . Join the group and Help the group to Improve. Information about PHYSICS, APT Workshop Series in Theoretical Physics and more... Free Download Question Papers and study materials.. NB : The details given here are taken from various sources. Please Verify the contents and contact us for your valuable suggestions.